2. Elizabeth (1752- ) possibly died in infancy; name reused? M1? before c.1748 Magdelena Yoder (1724- ) probably born & resided in PA. Did she die after only a few years, in child birth? Some sources list a marriage to a Christina (Hochstetler?). hi there: my family tree from John Hannes Indian Miller are: Susanna birthed Jonas Mishler m. Magdalena Eash who birthed Christian Mishler b 10/2/1833 d 4/9/1890 m. Mary “Polly” Gindlesperger b. 12/31/1838 who birthed Martha Mishler b. 08/12/1874 d. 10/24/1926 m. James Reighard m. 9/1906 who birthed Mildred Irene Reighard m. Earl Livingston who birthed my father Robert Eugene Livingston b 6/18/1934 d. 3/8/1997 m. Daisy Ellen VanPelt 8/17/1957 b. 4/16/1932 d. 7/30/2007 who birthed me Valerie Mae Livingston b. 5/24/1963 m. 8/15/1992 Michael Eugene LaFleur. All this info I found online by googling “Mildred I. Reighard” genealogy! which I am thrilled about as I’m in Connecticut. Thank you so much! Hello, Valerie. I’m so glad that you found our webpage. 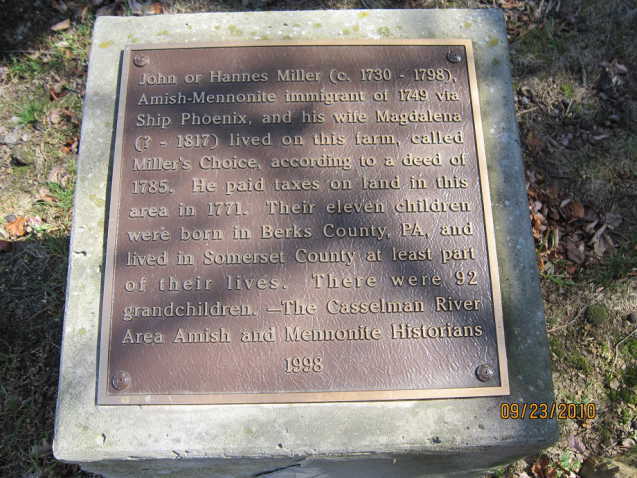 Believe me, we’re still cross-checking sources for “Indian John’s” ancestors and descendants, but he seems to be the landmark in our Amish-Mennonite history. Your line is interesting. Thanks for sharing! I am a descendent of your Susan’s Elizabeth Miller and Joseph Speicher through my mother, as well. My maternal grandmother was Myrtle Huldah Speicher* b.1900 in NJ, d. 1964 in NY, married John Schindler and then William Cashel. My uncle (father’s brother) did some research – he is now dead – and I am just starting to review it. So much conflicting information! Thank you for your website.